Grow more than three feet above the ground. Quick, lightening effect on the body and nervous system. Examples: fruits, nuts, avocados, dates, coconuts. Grow within three above the ground. High in nutrients, a great cleanser. 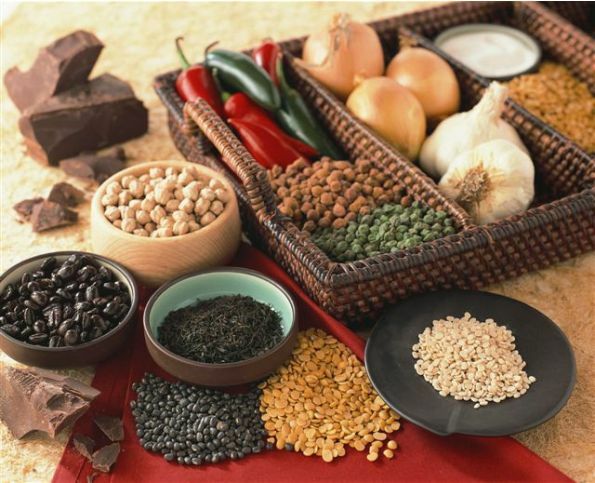 Examples: beans, rice, grains, green vegetables. Healing properties, great energy from the earth. Examples: potatoes, turnips, beets, garlic, ginger, onions. Tamasic: Functioning from need and instinct. You are what you eat. It’s a pretty simple equation. Choose which qualities you would like to have more of in your life and eat foods from that category. This choice of diet is a fundamental tool in leading a meditative and energetic life. For those free to live a quiet, contemplative life, a sattvic diet is perfect. For those who wish to maintain a meditative mind but also must live and work in the world, a diet consisting of sattvic and some rajasic foods is best. For those who practice demanding disciplines, like Kundalini Yoga or marital arts, rajasic foods are necessary, along with sattvic foods. For all these lifestyles, tamasic food is best avoided. Vegetarian diet is more healthy and beneficial for our health and fitness….It provides us more vitamin, protein, fiber, mineral, and nutrients in natural form……It improves our health by protecting us from various diseases.!!!!!!!!! !